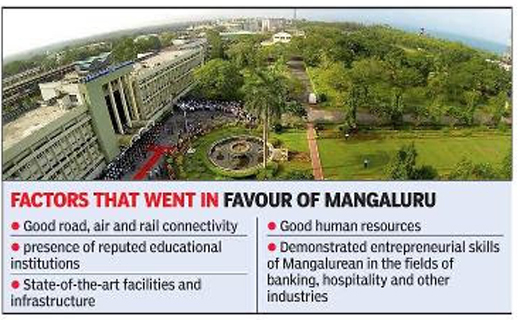 Mangaluru, Mar 13, 2017: NMAM Institute Of Technology, under Nitte University and NIT-K, Surathkal have been chosen from DK, to be India’s first startup district with incubators by Ministry of Commerce and Industry. Nirmala Seetharaman, minister of state for commerce and industry, who took initiative of making Dakshina Kannada as the start-up district with incubators has finalised two oldest technical institutes in the region. Connectivity (air, road, sea and rail), presence of several education institutions, state-of-art facilities, student resources and infrastructure were key factors to get these institutions selected for the centre. Vishal N Hegde, pro-chancellor (administration) of Nitte University on the subject said that recently representatives from both the institution had met Minister Nirmala Seetharaman at IIT-Chennai. Amitabh Kant, Chief Executive Officer, NITI Aayog too was present. "Under Make in India and Start-up India initiative they have chosen two educational institutions. We will develop an innovation centre at Nitte that is similar to IIT, Chennai and use it for young entrepreneurs," said Vishal. The innovation centre with incubators will be launched in Nitte Campus in Karkala in two months. The work for the facility is in near completion. New incubation facility will provide students the necessary platform for realizing their ideas like a workspace, comprehensive inventory and ample guidance. ``The government wants to encourage startups to provide innovative solutions for challenges unique to India, especially in education, health, manufacturing, agriculture and infrastructure, and not just be skewed towards developing apps,’’ he added. Apart from it there will be tinkering labs for schools aimed at encouraging the creation of innovative solutions in agriculture, health and education. Vishal further added that one of the main factors that Dakshina Kannada was selected for startup district is that it had given many successful entrepreneurs to country and abroad. "From yesteryears Mangalureans are known for their entrepreneurial skills and it evident in banking, hotel and other industries," he pointed out. In addition, NMAMIT already has been successfully running New Age Incubation Centre. Karnataka Biotechnology & Information Technology Services (KBITS), an autonomous organization established under the department of information technology & biotechnology, Karnataka government, had selected NMAM Institute of Technology, Nitte as one of the nine engineering colleges for ’Karnataka New Age Incubation Network’.